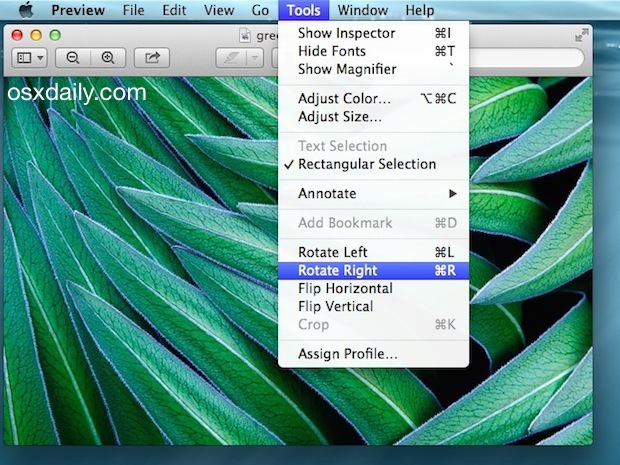 The Mac OS X Preview application has a a few little known image adjustment features for rapid image orientation flipping or rotation that are quite powerful, and if you’re looking to make quick adjustments to rotate a picture or mirror vertically or horizontally the general orientation of any image file, a great Mac app to do so is bundled on every MacOS and Mac OS X machine from the get go with Preview. Using the app to complete these tasks is quick and easy, here’s how to adjust orientation of either a single picture or multiple pictures at the same time. You can also use the same rotation keyboard shortcuts when modifying pictures in bulk through the Preview app if you’d like, and make quick progress of the entire task by selecting all images (Command+A), then mass rotating all of the selected images together by using either Command+R (for rotate right) or Command+L (for rotating left). Hitting Command+S will then save all the changes to the orientation, and you’re done! Whether or not it’s faster for users to go with the keyboard shortcuts or the File and Tool menus is purely a matter of preference, the end result is the same. Thanks! Awesome tip.. saved me a lot of time! The best way to rotate is import all pictures into iPhoto. lol iPhotos is dead, all hail the new Photos App! This helped me FLIP (not rotate) a photo! If this doesn’t work use a mirror!!! So all good with this – thank you very much! My “flip horizontal and flip vertical” option is not highlighted, how can I make it so I can access those tools?